Trinity came into GRROWLS after being given up by a woman going through a divorce, and I'm sure it was hard for her to do the right thing for her dog. Trinity was a sweet girl in need of confidence building. She got along with everyone, human and animal. 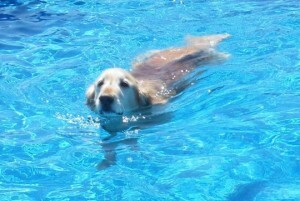 She loved to swim and spent a lot of time in the back yard pool, as well as lakes, ponds and the ocean- even after losing her sight at the age of ten due to complications as a result of multiple myeloma. She obtained her Therapy Dog International certification and was a great ambassador for GRROWLS during home visit evaluations, dog evaluations and fundraising events. I am so fortunate to have had her for ten years. She is missed !